toKernel aim of making developer's life easier would not be met if debugging options had been left out. All application events can be traced by defining the "log_debug" option as 1 in the application configuration file. This option gives you a way to still get application debug information at runtime when its running in development mode, regardless of whether on screen display of errors has been enabled or not. 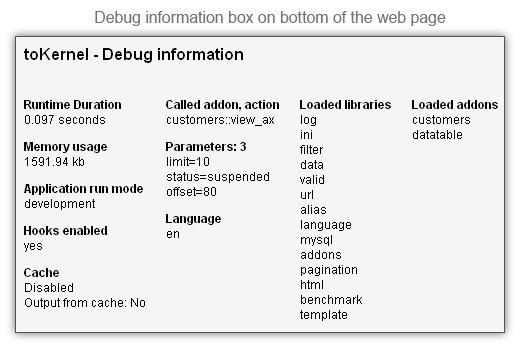 When developing a web aplication, you also have the option to receive debug information at the bootom of the web page. For CLI, this debug information can be shown in the CLI output. Website developed by Gavalian Branding Agency, Frontjet LLC, toKernel team. Copyright © 2010-2019 toKernel Development team.